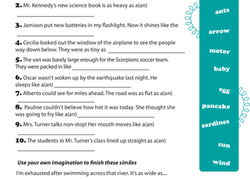 Assess student understanding of simple hyperboles with this writing exercise. Your kids will be hyperbole hotshots when they've finished this worksheet! Hyperboles are a fun way to get students thinking outside the box when it comes to their writing and descriptions.